Are College Athletic Programs Fumbling Corporate Partnerships? Excitement is in the air as a new college football season is days away. College football's popularity in the United States is solid. A 2016 Harris Poll found college football to be the third most popular sport in the country, trailing only pro football and baseball. Interest in football and collegiate athletics in general makes college athletic programs attractive to potential corporate partners. Brands value the affinity many people hold for their favorite college sports teams. Sponsorship of collegiate athletics is a vehicle for reaching consumers by associating with something with which they have an emotional attachment. A key to sponsorship effectiveness is communicating the association between brand and sponsored property. Sponsorship impact is one outcome for which a well-kept secret is not very helpful. The link between sponsor and sponsee should be made known for sponsors to receive maximum benefit from the association. Findings of the analysis suggest college athletic programs and their agency partners are misplaying opportunities to create value for their corporate partners. A surprisingly low number of college athletic programs have a page dedicated to corporate partnerships. Only 23 of 128 institutions (18%) had a page featuring names or logos of sponsors. Many websites had pages with titles such as "Corporate Partners" or "Sponsors," but in many instances these pages were for sponsor solicitation; they did not feature current corporate partners. A lower bar for sponsor integration on a property's website is placement of logos on site pages. Brands appearing in these placements usually were not identified as sponsors, but it was evident that their presence was consistent with that of a sponsor, not merely Internet ads. Sponsors were much more likely to be featured in this manner as 68% of institutions gave sponsors exposure, usually at bottom of pages on their sites. Still, nearly one-third of institutions did not give their corporate partners any exposure on their official athletic department website. Websites were more likely to have sponsor solicitation information than any other type of sponsorship-related content. Nearly three-fourths (73%) of websites had a page for sponsor solicitation. Often, the link for this content takes a visitor to an external website of the sponsorship management firm (e.g., IMG College or Learfield) with general information about sponsorship opportunities available. Does Power 5 Membership Matter? 27% of websites for non-Power 5 institutions (17 of 64) had dedicated corporate partner content; only 9% of Power 5 institutions (6 of 64) featured corporate partners with a dedicated page. More Power 5 institutions gave sponsors a presence other than a dedicated page than non-Power 5 institutions, with 39% of Power 5 institutions placing sponsor logos on their site versus 25% of non-Power 5 institutions doing the same. The practice of having a sponsor solicitation page did not differ depending on whether an institution belonged to a Power 5 conference or not as 72% of Power 5 institutions and 75% of non-Power 5 institutions had a solicitation page on their official athletics website. College athletic programs may be fumbling their relationships with corporate partners. 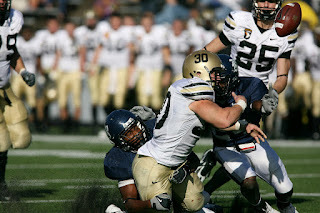 Sponsors are a staple for sports properties, but many college athletic programs are not effectively communicating their partnerships with companies and brands. Of course, website presence is but one element available to communicate a sponsorship. Properties may put greater emphasis on giving sponsors exposure in venues at sporting events as well as an on-campus marketing presence. That said, the relatively low number of programs touting corporate partners in the form of dedicated website space and content is surprising. The low percentage of institutions communicating their corporate partnerships is also surprising given that many of the sponsor solicitation pages reviewed touted website integration as a benefit sponsors could enjoy. The analysis conducted suggests there is much work to be done in fulfilling the promise of using college athletic program websites to communicate corporate partners' involvement. Sports business practitioners have closely watched TV ratings for the National Football League this season. Is the teflon brand of the sports industry vulnerable? Is fan interest waning? Would fan backlash to player national anthem protests and other negative PR show up in fewer TV viewers? Are there just too many entertainment options that pull away people from consuming NFL games? TV ratings for the 2016 NFL regular season reveal two things: 1) fewer people are watching NFL games and 2) the NFL is still a very valuable property for TV networks. ESPN sports business reporter Darren Rovell recently reported NFL TV ratings for the 2016 regular season were down eight percent from 2015. The comparison excluded Thursday night games as Twitter live streaming debuted this season as another option to watch and gave fans a non-TV option to consume. Ratings were down for all NFL TV programs and all networks. ESPN Monday Night Football took the biggest ratings hit, down 12% from 2015. NBC Sunday Night Football also suffered a double-digit ratings decline with a 10% decrease in ratings. Ratings for CBS and Fox Sunday games were down seven percent and six percent, respectively. The presidential election season is cited as one reason for the dip in NFL TV audiences. In fact, ratings were down more in the first half of the NFL season, which coincided with the run up to the election. However, the bottom line is NFL TV viewership was down this season. Should NFL executives and the TV networks be worried? In short, no. If the television industry handed out MVP awards, the NFL would need to bring a U-Haul trailer to the awards ceremony to pack all of its hardware. Despite a decline in audience viewership, it is undeniable that the NFL remains popular TV viewing. The average audience for an NFL game was 16.5 million in 2016. The NFL audience size makes it one of the strongest TV properties around. A recent Ad Age article reporting the top 50 TV program audiences for 2016 revealed that 11 of the top 20 programs were NFL games. All but one of the games were in the postseason, but the point is the NFL remains highly relevant as a TV product. The NFL is an MVP (Most Valuable Program) to its broadcast partners. Given that a single ratings point equals about 1.2 million viewers, NFL programs draw large audiences and in turn, the interest of advertisers. The TV audience is forever fragmented; we will never see a TV program with a 67.3 rating like that of I Love Lucy in 1954 (it helped to have three TV viewing options- no issue with media fragmentation in those days). Programs like NFL games offer the closest thing to the "good old days" of large audiences drawn to a single program. The consistent performance of the NFL as a TV property shows little signs of letting up despite a ratings dip in 2016. There is one huge caveat, though. The NFL must maintain interest in its product on the field and manage its image off the field. Arrogance or indifference to concerns about safety and player conduct could derail the NFL train. Otherwise, the NFL will continue to be an MVP for TV networks. Check out TV ratings for NFL regular season games in 2016 at Sports Media Watch. It is the time of year for predictions about what will happen in the coming year. 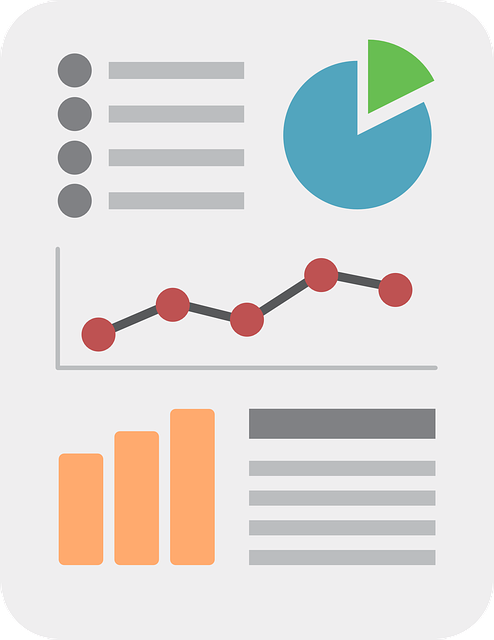 You name the topic, and you can likely find predictions about expected trends or developments. Predictions are informative for giving a heads up on what areas to pay attention to in the coming year. And, predictions can be provocative when they push boundaries of current practice or performance. This list yields no surprises as they are front burner priorities for many sports properties and companies. The pressing question is whether these trends become opportunities or threats for an organization. The difference maker will be innovation. 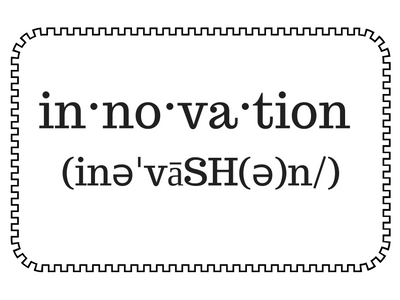 Innovation is crucial to an organization’s growth. And, it is said if you are not growing, you are dying as a business. Why is innovation central to an organization’s growth? It is central because of what innovation represents. 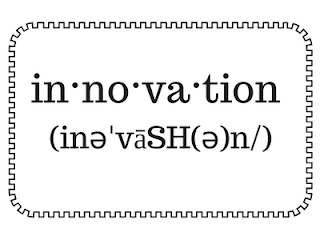 Simply put, innovation is “creating new value.” When you create new value, you maintain or enhance relevance of your products. We tend to think of innovation as new value that benefits users- think cashless concessions or smartwatches that capture personal fitness data. Innovation can be internally driven, too. For example, gleaning deeper insights from customer data to make staffing decisions that enable better customer service to be delivered during peak periods. In Chapter 1 of Sports Marketing (by Fetchko, Roy, and Clow- Routledge, 2016), one trait that distinguishes sports from other industries is a phenomenon referred to as an affinity advantage. What is an affinity advantage? It is a positive affective (emotional) disposition people have toward an object like a brand. Sports brands enjoy an affinity advantage over non-sports brands in that people are inclined to show their affinity for a brand. A quick look around the coffee shop where I sit writing this article I saw people wearing apparel with logos of Nike, University of Alabama, and Dallas Cowboys. I guess the Cuisinart, Kroger, and Purina fans were at home… although I have never seen those “fans” anywhere. The point is many people are willing to make an emotional investment in sports brands unlike any other brand relationship they have. That said, an affinity advantage is more like a head start than outright competitive advantage. Brands possessing an affinity advantage should cherish and safeguard it, not take it for granted and assume it will always be present… because it will not. It will be interesting to see how ESPN and other sports media brands fare in 2017. The days of TV-centric sports consumption are over, not to dismiss TV as an important communication medium. Realities of media consumption include reliance on multiple screens and more people not glued to the big screen at all. Innovation is the tonic media brands will have to rely on to leverage their affinity advantage and deal with shifts in consumption. Otherwise, the head start gained by the affinity advantage will be negated. ESPN and other sports media brands will be challenged to “create new value” to adapt to consumers’ shifting interests and behaviors. Happy New Year- Be innovative in 2017! Baseball is known as America's pastime. It is a game that recently celebrated its 140th birthday. Thousands of players have played professional baseball since Abner Doubleday introduced baseball in 1876. Moreover, generations of fans have followed the sport, with family members often passing down team loyalties from generation to generation. These characteristics of baseball bring out its timeless appeal, but they also carry less desirable connotations such as "old" or "outdated." Old and outdated are not necessarily compatible traits with a young audience coveted by Major League Baseball. What to do? MLB must do what every organization is forced to encounter: Take an outside-in approach to decision making. The outside part of outside-in is monitoring of the external environment; the in part of outside-in is making marketing decisions in response to what is learned from the external environment. In Chapter 3 of Sports Marketing, socio-demographic trends are identified as factors in the external marketing environment, or those forces occurring outside the organization that cannot be stopped or changed. Specifically, the growing importance of the Millennial generation is a socio-demographic trend that has the potential to significantly affect most businesses, including Major League Baseball. 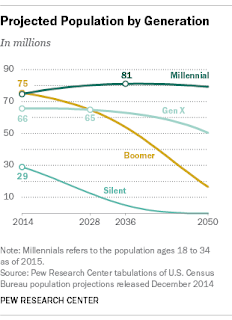 Pew Research classifies Millennials as persons borne between 1981 and 1997. This population group totaled 75.3 million people in the U.S. in 2015, surpassing the 74.9 million Baby Boomers (persons born between 1946 and 1964). 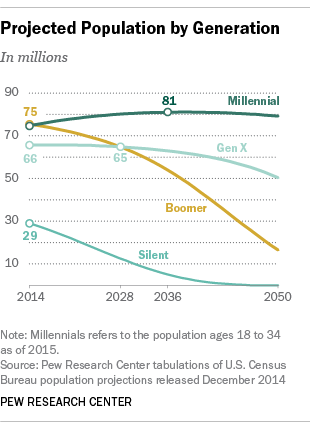 Millennials' importance as a population group will only continue to grow with immigrants boosting the number of Millennials in the coming years as projected in the chart below. Marketers must be cognizant of trends like the rise of the Millennials. More importantly, they must develop strategies to respond to the trends. According to a USA Today article, the average age of MLB's TV audience was 56 years-old in 2015. The average age of MLB app users fell in the upper end of the Millennial generation at 34 years-old. If MLB maintains status quo and does not adapt it products to younger consumers, it is possible they will become less relevant to Millennials. MLB to Swing for the Fence? Instead of an inning three outs in an inning, how about five batters? What if every inning started with the batting team having a runner on first base? Should players be required to attempt to steal a base? You may have read enough if you consider yourself a baseball purist- how dare they tinker with a classic game! But, MLB must at least consider such innovations to the product if it thinks today's customer will find value in it. Doing things the way they have always been done is not an acceptable business strategy in any industry, particularly when the market from which you attract customers is transforming as it is in the United States. 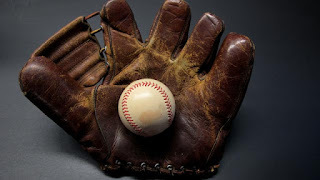 Baseball is revered by many people because of the strategic competition it can become, two teams making player adjustments and other moves in an attempt to gain the upper hand. MLB would be well-served by adopting the same approach as it scans the external marketing environment to determine how to respond to trends such as the rise of the Millennial population. What trends in the external environment do you see as most important that MLB recognize and respond to them? 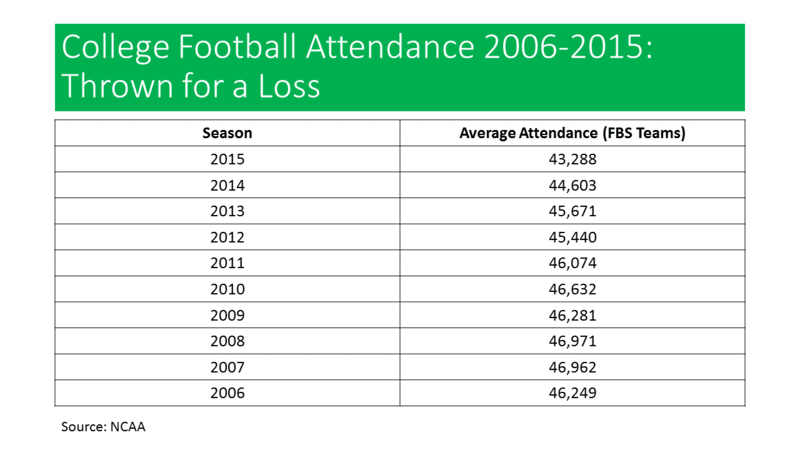 Does College Football Have an Attendance Problem? The pageantry of college football makes it one of the most compelling sports to attend in person in the United States. Tailgate parties, marching bands, cheerleaders, and more are staples of game day atmosphere on campuses across the country. The experience of attending a college football game sets the sport apart from other collegiate sports as well as its professional counterparts. 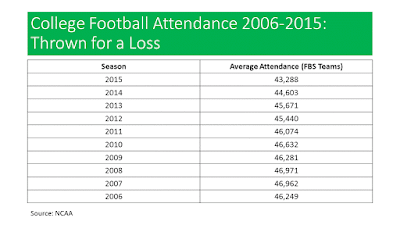 College football has one other unmistakable trait associated with it: Declining attendance. Attendance figures compiled by the NCAA reveal a slow but steady decline in average game attendance. The average number of fans taking in a game at the Football Bowl Subdivision (FBS) level has decreased 6.4 percent over the past decade, with the average of 43,288 fans being just under 3,000 fewer fans than on average ten years ago. Many sport properties that saw attendance declines in the wake of the 2008 economic recession would cite the economy as a reason for such a drop. However, a review of annual attendance figures suggests a gradual drop not caused by a single external factor like the economy. Attendance figures show fewer fans showing up for football games. However, the question begging for an answer is "why." Unfortunately, the answer is a complex one. Marketing incentives- Amenities offered in a venue or promotional tactics intended to influence attendance (e.g., t-shirt giveaway). Known as the Theory of Personal Investment, the model suggests that attendees are motivated by different factors. Some attendees are influenced most by the sport or team, which might be an obvious influence. But, there are other attendees who may have less interest in the teams playing than in the chance to spend a few hours having fun with family or friends. Also, a person may make the decision not to attend at all, particularly if indirect consumption is an option, especially watching an event on television. There are no lines for food or restrooms, it is climate controlled, and inconveniences like parking and traffic are nonexistent. Short-Term Slip or Permanent Shift? What are your thoughts about attendance trends in college football. Interest in the sport remains strong, so is it only a matter of time before attendance increases? Or, is the gradual decline in average attendance over the past decade the new normal in college football, with perhaps more years of decline in store? Moreover, what can sports marketers do to entice people to return to stadiums on Saturdays using marketing incentives? It is not possible to create, communicate or deliver value without first knowing customers and the effects of the marketing environment on customers and the organization. In turn, this insight equips an organization to create, communicate, and deliver what will please customers while benefiting the organization. 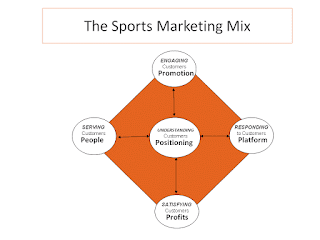 In Chapter 1 of Sports Marketing, positioning is identified as one of the five Ps of the sports marketing mix. It is no coincidence that positioning is placed in the center of the graphic below. Why? Positioning must be the center of all marketing activity. Any decisions made without a firm grasp on needs and wants of the market are risky, at best. Positioning as used in the sports marketing mix is different than the usual definition of the term positioning, which refers to a point of difference a brand holds relative to competition in customers' minds. 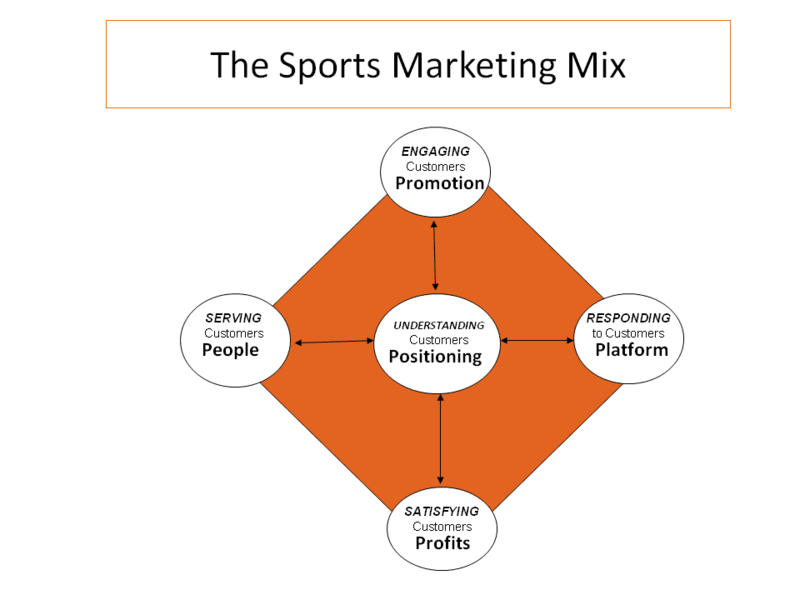 In the sports marketing mix, positioning is all about understanding customers, in effect enabling an organization to position itself to carry out the definition of marketing. 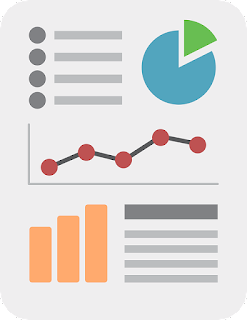 Decisions impacting the other four Ps (platform, promotion, people and profits) should be based on the understanding of customer consumption, the external marketing environment, and market segmentation resulting from analyzing the customer and external environments. A sound marketing decision can ultimately be traced back to an organization's positioning efforts. An example of this connection is how Gatorade is developing the next generation of sports drinks. Gatorade is an iconic brand that invented the sports drinks category. However, declining sales and competition from brands outside the sports drink category like Red Bull, Monster, and Vitaminwater have led Gatorade to revisit the positioning element of its marketing. Gatorade is looking to create value for athletes by incorporating technology to help determine optimal quantity of fluid intake as well as the appropriate levels of carbohydrates, calories, and electrolytes given an athlete's individual needs. Check out this video from Gatorade on how it partnered with Brazil's national soccer team to deepen its understanding of users and translate it into better product offerings. Gatorade: Hydration, Redesigned from Smart Design on Vimeo. Gatorade can leverage its positioning efforts to pursue additional opportunities beyond improvements in sports drinks. The company is targeting other food products to market that fulfill the same desire of fueling one's body for optimal performance. Can you identify an organization or brand that excels at managing the positioning element of the sports marketing mix to uncover and pursue business opportunities? Think of the brands that you have a relationship with as a customer. For how many of those relationships would you tolerate inconsistent product quality, safety hazards, rising prices, and negative publicity about a company's employees? Most of us would likely discontinue doing business with that company and find another source to meet the need that the offending company provides. Yet, the National Football League seems immune to the pitfalls that would drive many customers away. The NFL has been associated with a long list of negative press related to player conduct off the field, player safety on the field, owners' quest for revenue, and top leadership that seems out of touch. Yet, brand NFL appears to be as popular as ever. Evidence of the NFL's popularity can be found in its TV ratings- nearly all of the top rated TV programs this fall were NFL game broadcasts. And, the NFL has consistently ranked as the most popular sport among Americans in an annual Harris Poll. How does the NFL overcome the missteps that would doom many brands? In a word, it is "affinity." What is an Affinity Advantage? Affinity has been defined as "an attraction to or liking for something." Sports enjoy what is described in Chapter 1 of Sports Marketing as an affinity advantage. Many customers (fans) of sports brands have a liking that is much deeper and more intense than other brand relationships they have. Let's face it, you don't see people showing their affinity for Whirlpool (appliances) or Timex (watches) by wearing caps or t-shirts adorned with those brands' logos. Most consumers do not have such a deep connection with the brands they consume everyday that they want to express to others their feelings about their favorite toothpaste or auto insurance. Sports brands are the envy of marketers in most other industries because of their affinity advantage. If only they could have customers as passionate as fans that pay premium prices to watch games in frigid cold or heavy rain. You could say that sports brands enjoy a head start over their non-sports counterparts. But, the affinity advantage alone does not translate into business gains. It is up to sports brands to leverage their advantage by seeking revenue opportunities that enable fans to act on their affinity. At the same time, these opportunities can advance the brand not only by generating revenue but by deepening customer relationships. And, leveraging the affinity advantage is not limited to sports properties. Other businesses can tap sports to develop new product offerings. An example of leveraging fan affinity as business opportunity is the recently announced comic book featuring Seattle Seahawks quarterback Russell Wilson. Portland-based STORM Comics is publishing "Fame: Russell Wilson"in print and digital formats. The work chronicles Wilson's rise to one of the NFL's top quarterbacks. It would make for interesting discussion to consider new products that could be created to take advantage of the affinity sports fans have with their favorite teams and athletes. What other opportunities exist to appeal to fan affinity?